It’s Electric Forest, June 2015: The music is blasting, the crowds are packed in tight, and good vibes abound. The Sherwood Forest has once again come alive, playing host to more than 150 rock, roots, and electronic bands on seven stages throughout the scenic woods. Thousands of die-hard fans who sold out the show in less than 24 hours are here to experience four days of music, camping, and state-of-the-art light displays hidden in the trees. Among the “foresters” who flocked to Rothbury (on Michigan’s west side, just north of Muskegon) is Hailey Moen, who traveled from Minnesota. 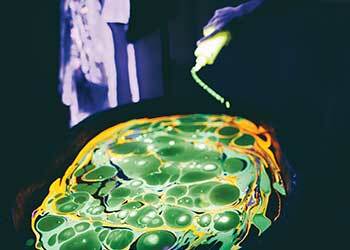 At Black Light Visuals’ tent, she dips her arms into a tub filled with dark liquid, with swirls of color dancing on the top. 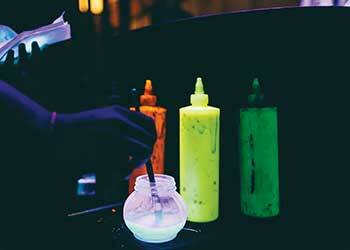 Black lights change the pigments from dark to light, creating a series of illusions. Secret Recipe: Brad Lawrence perfected a “hydro-dyeing” technique. When her arms emerge, her skin has been replaced with ribbons of color: thin lines of black, yellow, red, and turquoise forming a marble pattern. Moen has been transformed and looks like the physical embodiment of her surroundings. She’ll repeat this process twice before the weekend is over. While she was complimented by fellow concert-goers all weekend, Moen was just one of many painted by the team at Electric Forest, and judging by the social media response alone, they left an impression. 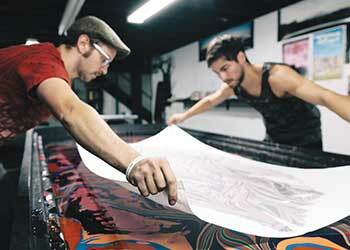 Clarkston-based Black Light Visuals is the creation of Brad Lawrence. After graduating with a fine arts degree from the College of Creative Studies in Detroit, he planned on making his living as an artist, landing large commissioned charcoal drawings. 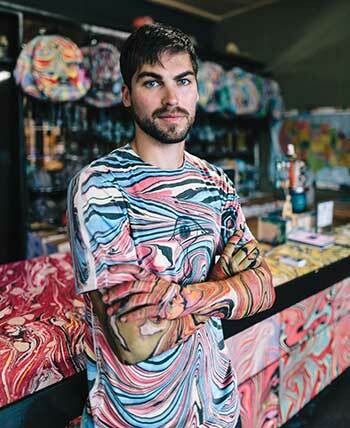 At the same time, inspired by his father’s silk-screening career, Lawrence created “hydro-dyeing,” which is the process by which he paints bodies, T-shirts, and everything else imaginable. Then tendonitis in his wrists kicked in, a chronic condition that worsened, rendering him unable to hold a pencil, much less create his signature pieces. He was too nervous about failure to abandon his traditional artistic projects, but after a while he didn’t have a choice. However, mixing paints has become a form of therapy for Lawrence, and that along with physical therapy has helped him regain some function in the past six months. He’s not sure if he’ll ever be able to draw or paint again, but says the work he does with Black Light Visuals helps him retain his creativity. In the past few years, Lawrence has perfected his secret recipe of pigments, which allows him to permanently dye basically anything. Shirts, hats, bandanas, and backpacks are among the fan favorites, but nothing is off limits and music festival-goers often turn to Black Light Visuals to ensure they can see (and be seen with) their favorite bands in style. He also calls his body painting (which washes off easily) the “ultimate conversation starter” and says it helps people tap into the energy of different concerts. 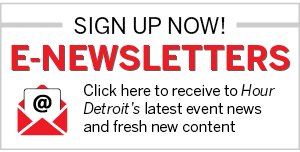 The goal is to create a more interactive experience for fans at music festivals like Electric Forest. “This adds another dimension because we have black lights and lasers and people can get [their bodies] painted and interact with the whole thing,” he says. 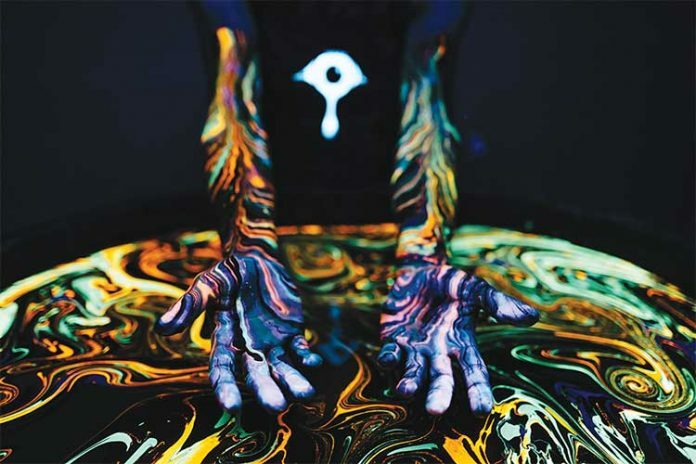 Lawrence says the wow factor is a part of what’s given Black Light Visuals such a huge following, including at least three fans who have had Black Light Visuals’ logo tattooed on themselves. A tour of the Black Light Visuals studio — which seems a little out of place on the sleepy streets of Clarkston — takes more than two hours, not because it’s big, but because amid the boxes of inventory and tubs for dyeing, every surface holds a memory for those who are a part of this team. There’s a ping pong table and drum set in the basement. A plaque that reads “What Would Frank Lawrence Do?” pays tribute to Lawrence’s father, a fellow artist and longtime inspiration. Two of Lawrence’s last traditional artwork have found homes on the brick walls. Other pieces of art in every imaginable medium, combined with Black Light Visuals’ signature style, adorn the walls, evidence of the company’s interest in collaboration with anyone with a voice. Lawrence has curated a unique, eclectic family at Black Light Visuals. With a handful of full-time staff members and even more people signed on as hourly help, the dedication is contagious and enthusiasm is palpable. One such team member is Gavin Mahoney, 6 feet of laid-back, creative energy. Mahoney was swept up as part of the team after meeting the Black Light Visuals crew at a music festival. Though leaving the security of a 9 to 5 marketing job to embark on this adventure was certainly a risk, Mahoney has no regrets — he respects the group’s mission and vision.